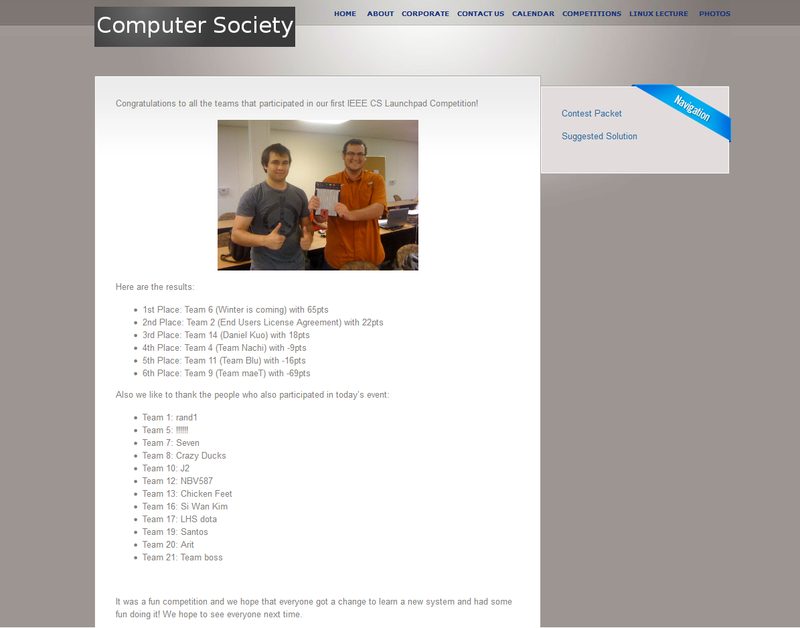 Matt and I won a TI sponsored Launchpad programming contest that was held by the IEEE CS here at The University of Texas at Austin. Here is the link for the details. In case the IEEE site goes down here is a screen cap of the page. My partner Matt on left. Parker (me) grinning like a fool on the right. I did the majority of the programming and design work where Matt debugged my code as I wrote it saving allot of time. The idea was to create a simple secret knock security system that could record a knock “pattern” and then only unlock a door when the pattern was repeated. Only three hours where given for the competition and we where the only ones to finish everything in that time slot. They extended the contest another hour to permit more teams to finish. More details about the contest can be had by downloading the packet they gave us. The code is a bit rough around the edges and the bulk of the program happens in the timer interrupt (which is a no no) but for only 3 hours to solve, design, program, and debug a solution; sloppy code is a bit expected. Points where awarded based on a few areas. questions about the problem; this is for help solving the problem. We scored 65 points where the nearest team behind us only scored 22 points. We dominated the competition. The judges loved the simple interface and the admin password setup. The code was fairly changeable so you can adjust the precision of the knock (humans are not robots) and how long the passwords are. Teams that did finish had no where near the feature set our solution had. This contest made me wonder if GPA should even be a consideration for companies like Texas Instruments in hiring. I have a 2.8 GPA and have a hard time realizing that I actually had the lowest GPA out of the entire contestants and I completely schooled everyone that had 4.0 GPAs. I think this goes to show that theoretical knowledge != practical knowledge. Hey maybe since Texas Instruments sponsored this event I could possibly get a career out of it? To anyone out there hiring an embedded systems engineer and want a motivated worker that will tackle projects with all of his might? Hire me!